HAIL OF BULLETS "Kamikaze Bulldozer Assault"
In 1931, the empire of Japan seized the Chinese territory of Manchuria and began their bloody march to conquest. In 1937, all-out war would follow with China and the Japanese would ramp up their aggressive attempt to conquer every nation in the Pacific Rim. Only the might of America's navy stood in the way, leading to the "Day of Infamy" at Pearl Harbor in 1941 and America's full entry into the Pacific theater of war. The bloody conflict would result in infamous names like Bataan and Corregidor become part of World War II battle lore, until Japan was finally brought low by the atomic assaults at Hiroshima and Nagasaki in 1945. To chronicle the most destructive conflict of all time, an equally powerful and relentless force is needed. 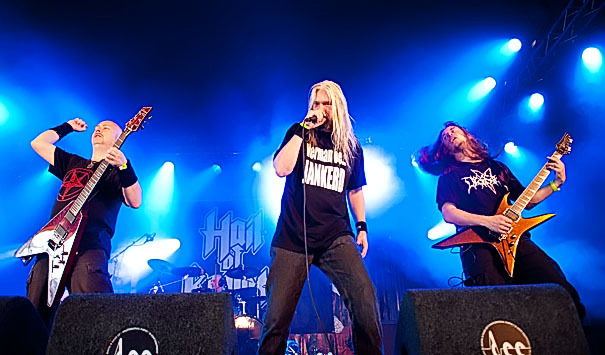 That force is Holland's Hail of Bullets, the bruising old school death metal band who made such a powerful impact with their debut "Of Frost and War". That ultra-heavy platter told the story of the Nazi campaign in Soviet Russia. So it makes perfect sense that Hail of Bullets turn their eyes further eastward to tell the story of the Pacific conflict with their new disc "On Divine Winds". WORMWOOD CHRONICLES: Greetings, Ed! 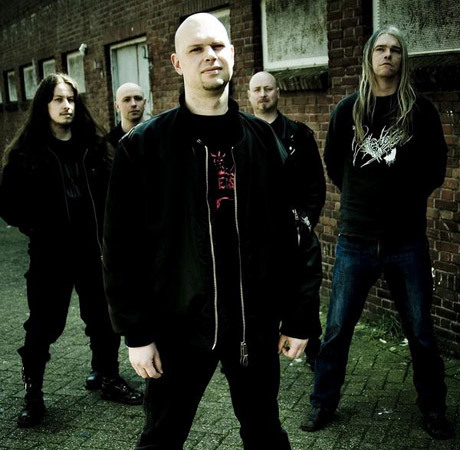 The debut record "Of Frost and War" was such a successful first strike for "Hail of Bullets". What goals did you set up for "On Divine Winds"? ED WARBY: First and foremost ,we wanted it to be a stylistic continuation and seek improvement in areas such as sound and arrangements rather than altering the musical direction. I felt that while the first album sounded massive there was a lot we could improve upon, so the directive for Dan (Swano, producer) was "like this, and then better". He calls it the Hi-Def version of the debut, haha! And in the end you can only make the best album you possibly can, so for me personally that goal was met royally. WC: The new album deals with the Japanese military. What's the timeline for the events covered on the album and why did you choose this subject? EW: The album starts out with the attack on Pearl Harbour, since I can't think of a better way to open an album. After that, we go back in time to a sabotage-related incident that happened in 1931, which effectively planted the seed of war. From there we touch upon the major events until we end up at the Japanese capitulation. Interestingly enough Martin (van Drunen, singer) decided to leave out the atomic bombs on Hiroshima and Nagasaki, since he strongly felt that the incendiary bombings on Tokyo were of miuch greater influence on the Emperor's decision to surrender. WC: What kind of research did you do for "On Divine Winds"? Did you talk to veterans of the conflict or visit any of the actual locations? EW: Martin gets most of his inspiration from books, loads and loads of books. At one point he got stuck, some kind of writer's block, so to give his inspiration a jolt he decided to take some time off for a trip to the US so he could see the naval fleet. He was not able to locate any veterans, but seeing the warships did the trick. As soon as he got back he finished all of his lyrics and even replaced some of his previous work with new material. WC: War is obviously the main lyrical theme of Hail of Bullets. Do you restrict yourself to World War II or will you go to other time periods? Maybe even the future? EW: For now, we'll stick with WWII as we feel it's the most fascinating period, but it's not unthinkable that we'll turn to other wars later. The future? I don't see that happening, Martin's into history, not sci-fi. WC: What did you learn about the Japanese military that was new? What surprised you about the subject? EW: I personally didn't know much about the Pacific at all, Martin really had to educate us so we could "feel" the subject matter in order to write the appropriate music. What I did already know was the incredible dedication the Japanese had, and learning more only re-inorced that impression. The most interesting tidbit I took away from this project was the fact that the capitulation speech we use in "To Bear The Unbearable" was recorded onto grammophone so it could be smuggled out of the imperial palace unseen by the army, who were strongly opposed to such a dishonourable act. WC: How did the recording of "On Divine Winds" go compared to "Of Frost and War"? Was it more comfortable, more intense? EW: Both actually. Apart from the drums and vocals we decided to record everything in my home studio. We found that on the first album some sessions were a bit awkward because our vision didn't always match that of the person operating the recording equipment. Certain things we like, such as little squeaks or noises were carefully edited out of each take and we ended up having to redo some stuff to bring it back to life. So this time I was adamant to handle most of the recording myself, a bold and slightly foolhardy decision which saw me working on this album for 9 months straight. For the other guys it was definitely more comfortable, they could come in and do a take whenever they felt like it, and there was none of the pressure you normally have when you know each fumbled take costs money. For me, it was much more intense since I had to monitor and co-ordinate every aspect, which got pretty overwhelming at times. But in the end I'm glad we did it this way, because more than ever this album's 100% what we wanted it to be. WC: You play a very straightforward, mid-tempo style of crushing death metal. Is there room for any experimentation in Hail of Bullets or are you in a pretty comfortable groove? EW: Pretty comfortable here, yessir! I don't think we'll ever deviate too much from the style we play now. This is the kind of death metal we all love, and any experimentation would only lessen its impact ,I think. Of course we're willing to try some new things, such as the jangling guitars in "Tokyo Napalm Holocaust" (some of the guys were a bit shocked when Steph (Gebedy, guitarist) and I presented that one but it turned out to be one of the most impressive tracks I think) or some Thin Lizzy type twin leads, but the basis will always remain simple, groovy and catchy old school death metal. WC: How are songs composed for Hail of Bullets? The band has a lot of experienced members...do they all get their say? EW: Yes, although I write the bulk of the material. The way we work is I make a rough demo, be it one of my own songs or one by Steph or Paul (Baayens, guitarist), and from there we build it up based on everyone's comments until we're all happy with it. I suppose I have the strongest musical vision, but unless all 5 of us are really convinced of a song it doesn't end up on the album. WC: The members of the band, including yourself, do "extra duty" in other projects like Asphyx, Thanatos and more. Does this present problems when Hail of Bullets plays live? EW: Not at all, we keep a combined agenda for all bands involved so there's no double bookings and we sometimes even travel to festivals together. So far it works great, and I don't see any problems in the future either. It's one big happy metal family! WC: Is there one particular track on "Of Divine Winds" that you are especially proud of? What would you say is your favorite? EW: My favourite track is "Operation Z", I really wanted to write a classic Album Opener, like Judas Priest's "Electric Eye" or Carcass' "Reek Of Putrefaction" (the song that is). A track that gets your heart pumping and the adrenalin flowing, one that really grabs you and says "strap in cause you're going for one helluva ride!". I'm not saying we're anywhere near the majesty of those tracks, but it's a pretty good effort. Another one that I think turned out real well is the aforementioned "Tokyo Napalm Holocaust", possibly the most sucessful combination of music and lyrics we've done so far. If you close your eyes you can almost smell the burning bodies... and lastly I'm very proud of the closing track "To Bear The Unbearable", I play most of the instruments on it because it's tuned down to A and I didn't want to subject the other guys to countless hours of detuning horrors. Probably the doomiest track we've done. WC: It seems your lyrics relate the straightforward facts and horrors of war. Have you ever gotten any flack from extremists saying you're Nazis, you're Communists, you're fascists? It seems most war-themed bands have to deal with this sooner or later. EW: Yeah sure, but not nearly as much as we feared. We get stupid messages on our MySpace sometimes, like "you commie bastards" or some crap like that, and I noticed some of the fan-made videos on YouTube do veer into questionable territory, but luckily we are not held responsible for those. Even in Germany the reception has been great, and they're VERY sensitive to any fascist tendencies, imagined or real. The stuff on "Of Frost And War" is obviously painful to them, in every way imaginable, but at our first German show (Party.san) I saw people in the front row crying when we played "Berlin", and not just a few either. Most of this has to do with the way Martin approaches the subject I think, it's obvious he's not going for sensationalism, or any political message. If there's anything he's trying to convey it's that war is hell. Can't argue with that now can you? WC: What would you say have been the high point and the low point of Hail of Bullets so far? WC: What live plans do you have? Will you be touring the States for the new album? EW: Touring is a big word, but we'll definitely come to the States at some point next year. We played the Maryland Death Fest last year and that was truly awesome, despite the suffocating HEAT! We're still booking for Europe now though, got some cool festivals lined up as well as selected club shows, we don't play much but what we do has to be fun. WC: Will you continue to produce all the Hail of Bullets efforts yourself? EW: That does seem likely. I'm a massive control freak and I don't think I could take a step back in that area. Besides, it works well for us and it gives us a great sense of autonomy, which I really value. Dan really doesn't like the recording/producing side of things, so even if our budget rose astronomically I still don't think we'd take a different approach. WC: Is there one military character from history that you would like to meet and talk to, if you could? WC: What's new with your doom metal project The 11th Hour? Will there be more from them? EW: Absolutely, although I'm not necessarily a gloomy person I find that doom metal is the perfect outlet for me. If I sit down with a guitar, the musical sadness just comes gushing forth somehow. I've already written 5-6 songs for the next album, so I guess I'll start recording in a few months. For now we've been doing live shows, starting with what was planned as a one off at the Dutch Doom Days but I enjoyed it way too much. Next month we go to Spain for Madrid Is The Dark, and there's already some stuff lined up for next year as well. On stage I sing and play guitar and I've assembled an ace live-band to back me up. The latest addition was my old Gorefest buddy Frank Harthoorn on guitar, I'm very happy to be reunited with that guy. WC: Is Gorefest finally and conclusively finished? If so, what would you say their legacy is? EW: Yes, not a shred of doubt about that. Like I said I'm very pleased to be back in a band with Frank, but I have no interest in ever teaming up with the other 2 guys again. I prefer saving my energy for more rewarding enterprises these days. Our legacy is "False", which by now can be counted among a handful of classic European death metal albums, and I'm glad we were able to end our career on a very high note with "Rise To Ruin". To my mind it's the best album we ever made, and although our chemistry was rather volatile, on that one everything just works. Too bad it all fell apart afterwards. WC: What was the last CD/album you bought just because you wanted to hear it? EW: Runemagick - "Darkness Death Doom", an album I'd been reading lots of good things about but it's almost impossible to find. So I decided to order a copy and it doesn't disappoint! I buy a lot of CD's still, around 15-20 a month, mostly metal. WC: What was the last gig you saw just because you wanted to check the band out? EW: Entombed here in Rotterdam, I was curious what they'd sound like with a 2 guitar line-up again and while it didn't equal the beastly roar of the early days they sounded great nevertheless. WC: Has there ever been any "Spinal Tap" moment for Hail of Bullets or your other bands that you could share with us? WC: Thanks a million for your time! Any final words? EW: You're welcome, and I hope lots of people reading this get inspired to check out "On Divine Winds"!